Even though fish is the main ingredient in this dish, it is definitely not a diet meal. First of all, the salmon skin is quickly fried and crisped up in mix of grapeseed oil and butter, more butter is added and flesh side of fillet is slowly poached till almost done. Then you have the potatoes that are mashed with 35% cream, 3.25% milk and mayonnaise. Yes, mayonnaise. I usually use sour cream but I didn’t have any, so out came the mayo jar. Man, I have really pigged out on this one! But, was it ever so creamy and supper delicious! 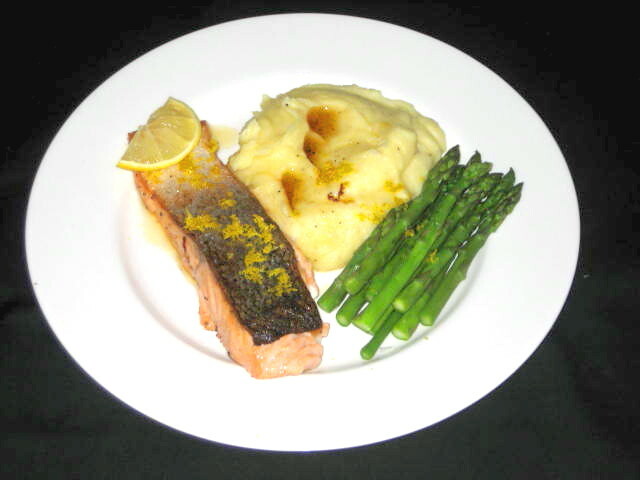 I served the salmon with steamed asparagus tossed in brown butter, lemon zest and a slice of lemon.